“Gordon Reeve has a funeral to go to. His journalist brother has been found dead in a car, a presumed suicide. Not a nice reason to be flying the Atlantic. And when he gets there it seems that nobody wants to answer his questions – why was the car in which his brother's body was found locked from the outside? Why does the local cop act like his shadow and prevent him talking to the friend who saw Jim last? Why does he have the sinking feeling that it wasn't a ghost he saw parked outside the crematorium? Blood Hunt – the last novel written by Ian Rankin under the pen name Jack Harvey. Any person who has already read Ian Rankin's first Inspector Rebus novel Knots & Crosses, would naturally be attracted to this piece of work, as it features Gordon Reeve – showing the other side of his life. But, it is not necessary for you to have read Knots & Crosses to understand this novel – this makes absolutely no reference to any Rebus novel and is very much a stand alone. Ex-SAS personnel, Gordon Reeve, now a tutor, doing survival training programmes for aspiring bodyguards or any other dangerous profession at South Uist, a Scottish Island in the Atlantic. He gets a phone call, informing that his brother had been found dead at San Diego, California, USA. On reaching there, Gordon Reeve is convinced that his brother has been murdered. However, the police are not willing to cooperate with Reeve and he isn't willing to let all the mysterious questions surrounding his brother's death (as mentioned by the publisher) go unanswered. His brother was working on an article on Bovine spongiform encephalopathy[BSE(commonly known as mad cow disease)] which might embarrass certain parties if the article comes to light. So, Reeve is now an avenger, although, he doesn't know who he is against and if he thinks he is not in danger, he is mistaken. This book was is a wonderful thriller, probably the best I've read so far. It has a brilliant plot, good language, expressions and dialogues and to top it all, no boring sub-plots. What I like about Rankin's non-Rebus novels are his complex characters which gives me a lot of knowledge such as Miles Flint in Watchman (although it was on bugs, which didn't interest me) and Gordon Reeve in Blood Hunt. Gordon Reeve's interest in anarchism and Nietzsche and Reeve has managed to pass on his interest in anarchism to me. I had also failed to find any loose ends in the book, maybe because I read the last 150 pages in around two hours (my reading speed is around a page per minute). The best thing I liked about this book was that it had a very proper and precise ending, which was lacking in most of the other Ian Rankin books which I've read so far. The downsides of the book were very few, but for someone who had read Knots & Crosses, the fact that there was no reference to John Rebus considering that he was supposed to be such a close friend, it would have definitely been disappointing. Moreover, Gordon Reeve reminded me of the protagonist in an Alistair MacLean novel which I just read. This is a very good book to read if you're interested in thrillers and it deserves a rating of eight. I’ve a liking for history and I possess a particular interest in gathering information about the two world wars. When I wanted to read works of fiction on the world wars, I was immediately redirected to Alistair MacLean. 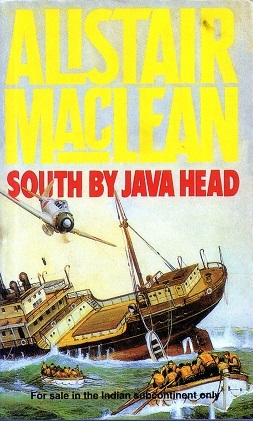 I picked South by Java Head since my knowledge on the Pacific War isn't all that high (The edition I purchased was also rather inexpensive). Coming to the plot, retired Brigadier Foster Farnholme is at Singapore and he is desperate to leave. The reason being, he has the complete plans for the Japanese invasion of Australia and wants to hand it over to the Australians. Unfortunately, the situation isn’t favourable to him, the Japanese troops are all over Singapore and the British forces were all set to surrender on the next day. Farnholme along with some people leave Singapore and after a chain of events in the sea, they end up in a British – Arabian tanker Viroma led by Captain Findhorn and his trusted subordinate John Nicolson. But, they know that they aren’t going to be out there for too long and the Japanese may attack them any time. The plot is centred on John Nicolson along with a romantic sub-plot between Nicolson and a nurse. When I was suggested Alistair MacLean, I was told to expect a thrilling adventure, an element of suspense, traitors and double-agents and of course, protagonists surviving beating all the odds. South by Java Head fulfils all these, including the last one. It had a brilliant adventure, desperate people trying to reach Australia by sea from Singapore. An element of suspense – when the Japanese are going to attack and how this little crew is going to cope up with it. Protagonists surviving beating all the odds – I’m not willing to make this a spoiler. Definitely, you’d also be made to guess who is going to be the traitor, there might be one or more. But, the book certainly also has several drawbacks. Alistair MacLean might be well known for anything else, but certainly not for his language, with most of the dialogues being flat and boring and also had occasional grammatical errors. I also didn’t like the way the author portrayed the Japanese, as heartless killing machines and frequently referring to them as “those inhuman devils”. Besides, people who aren’t familiar with maritime terms would find it difficult to understand the navy jargons. Moreover, the end to the sup-plot was also quite abrupt, as though the author used it only to lighten the entire plot and had no intentions of giving it a proper finish. There were also several loose ends, such as; it was never mentioned why Farnholme had a liking for the two year old boy and why he had to arrange such a dangerous trip for him. However, the bottom-line is, whether the reader contemplates if the occurrences are possible in a real situation or not, the reader would certainly enjoy reading this book. This book is highly recommended to those who are in the same “boat” as I am in terms of interests. I’m willing to give this book a six out of ten, because of the excessive number of negatives. Tooth and Nail is the third book in the Inspector Rebus series. Its predecessor, Hide & Seek was a disappointment and it hence, when I started reading Tooth & Nail, naturally, I didn't have any high expectations on this book. I became eager to read Tooth & Nail when I learnt that Rebus' next case is not going to be at Edinburgh, but at London. London is terrorised by a murderer who has already killed four women, women with absolutely no connection (in terms of profession, ethnicity, background, etcetera). The killer is christened Wolfman by the press since the body of the former's victim was found at Wolf Street. John Rebus, after his successful tracking down of a serial killer in his first adventure (Knots & Crosses), his fame, to his surprise, reached the south, and he was deemed an expert with serial killers (little did the Scotland Yard know that the first case was a personal confrontation). So, he had to carry with the burden of expectation from the Lothian and Borders police back at Edinburgh and at the same time, cope up with the racial slur from the London folk. Probably because I didn't have any high expectation, I found this book to be quite interesting. After a gap in Hide & Seek, Rebus' personal life had been touched upon again, with a sub-plot in the book on his personal life and it was also reasonably well connected to the main plot. Although the usual sidekicks of Rebus don't appear in this, his very presence, owing to his astute characteristics, is more than enough to make the book interesting. Rankin also managed to grip the reader's fingers to the pages of this book, and I was constantly guessing who this Wolfman was going to be and what made the job all the more difficult was that at a particular stage in the book, the author manages to convince the reader that around half a dozen characters have equal chance of being the Wolfman. Since Rankin had already moved out of Scotland, in order to not lose his identity as a Scottish crime novelist, he also introduced a lot of Scottish words such as hoolit, messages (groceries), wersh, etcetera. But, like most of the other Ian Rankin books I've read so far (The Flood, Knots& Crosses, Watchman, Hide & Seek, Tooth & Nail and A Question of Blood), Tooth & Nail too had a disappointing finish (Hide & Seek's was satisfactory while A Question of Blood's finish was good). This maybe owing to the fact that Rankin as a writer is still young but when it comes to a crime novel, the end is very crucial and if that isn't proper, it undermines the novel as a whole. There were also a few loose ends, topics which needn't even have been brought up, put in crude terms, done just to increase the number of pages and make the reader make stupid guesses about the Wolfman. In terms of language, facts, the amount of excitement it offered to the reader and the finish, in a scale of ten, I'd give this book a seven. The Tin Princess is the fourth and last book of the Sally Lockhart quartet, written by Philip Pullman. 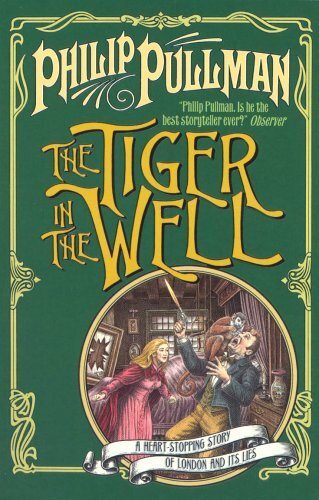 The story takes place during the Victorian Era, in 1882, one year after the events that took place in The Tiger in the Well. Adelaide, who appears in the first book, The Ruby in the Smoke, makes a comeback in this novel as one of the main characters. Razkavia is a small kingdom in central Europe, around as big as Berkshire. It has been in existence since the thirteenth century and is presumably sandwiched between Germany and Austria. Prince Wilhelm and his wife Anna have been murdered and his younger brother, Prince Rudolf becomes the heir to the throne of Razkavia. Prince Rudolf is in England has just been married to Adelaide. Unfortunately, during Rudolf's coronation, he was killed and now, Adelaide is the queen of Razkavia – a queen who doesn't know the local language and also illiterate. She has a translator named Rebecca Winter and James Taylor (who appears in the first three books) is appointed as her bodyguard. The book is supposed to be a “Sally Lockhart mystery” but, Sally's role in this book is insignificant and Jim is the main character of this book but that is not a problem as it could be understood that Sally is now married and settled. The book was reasonable but I feel some of it didn't have much logic. Adelaide was a Cockney Queen the previous day and in the very next day, Adelaide becomes a top diplomat solving problems that had been going on for centuries. The author does try to inform the reader that Adelaide, although illiterate is intelligent – like she is very good at playing chess and Rebecca could never beat her but diplomacy is not something obtained through IQ. The end was also extremely abrupt, almost like the author was under pressure to complete the book within a given target. Considering that this is the last book of the series, the author could have written a far more precise epilogue. If I've to describe the novel in one line : The worst book in the Sally Lockhart quartet. Hide & Seek is the second Inspector Rebus novel written by the best selling British crime novelist, Ian Rankin. The story takes place in Edinburgh, like in most Rebus novels and Rebus is promoted to the level of an inspector, from a sergeant. A junkie, named Ronnie is dead, due to drug overdose, in an Edinburgh squat. There are several confusing facts about the murder. He died due to overdose of intoxicated drugs, but the drugs he had been holding in his hand was pure. It also appears that he was beaten before he was killed. So, Rebus' task was to find out who killed him and what could have possibly been the motive behind killing someone like Ronnie. I was disappointed with this book. The story was developing very well but the end was disappointing and that is what is crucial in a mystery novel. I don't have much to say about this book and having read, “A Question of Blood”, I think it is safe to assume that the books become better as the series progresses. 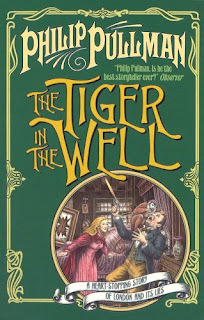 The Tiger in the Well is the third book in the Sally Lockhart quartet, written by the British author Philip Pullman, the author of the famous His Dark Materials trilogy. The story happens in 1881, three years after “The Shadow in the North”. “One sunny morning in the autumn of 1881, Sally Lockhart stood in the garden and watched her little daughter play, and thought that things were good.” - page 3. On a fine morning, all of a sudden, Sally Lockhart gets a divorce notice, from Arthur James Parrish, a person whom she has never even heard of. Parrish wanted control over the child of Fred (deceased) and Sally, Harriet Rosa. Unfortunately, every evidence was against Sally, the marriage certificate was perfect, with Sally's signature and there was no birth certificate in the name - “Harriet Rosa Lockhart” but only “Harriet Rosa Parrish”. Sally decides not to appear at the court and inevitably, Parrish wins the case. As the per the law, Parrish is entitled to take complete control over Sally's assets. Sally has no money, no place to live and has an arrest warrant against her due to several charges (including one for kidnapping her own daughter). This is a very good book. For the first time, Philip Pullman took the Victorian period to his advantage. The time period was insignificant in the previous books. These days, such a case might have been over in no time with the help of a DNA test but here, it could be a 431 page novel because of the era. There was also a good element of suspense. There were some unlikely coincidences throughout the book but that is what separates fiction from reality. What I didn't like was too many characters being introduced throughout the book but it can't be helped when the protagonist is forced to be a nomad. I really enjoyed reading this book but I'd recommend readers to read the previous books before reading this because this book has a lot of references to the events of the previous books and can be understood better. I'd give this book a nine. “Boy loves girl. Girl loves boy. They get married. Boy loves girl. Girl loves boy. Girl's family has to love boy. Boy's family has to love girl. Girl's family has to love boy's family. Boy's family has to love girl's family. Girl and boy still love each other. They get married. 2 states is a novel written by the Indian author Chetan Bhagat – the best selling English novelist in India. The book is autobiographical – the narrator of the book – Krish's resume will match perfectly with that of Chetan Bhagat. Krish Malhotra is a Punjabi, who studied at IIT Delhi and is now at IIM Ahmedabad. He falls in love with Ananya, a Tamilian from the Brahmin community and they want to get married. However, their parents don't agree because of the cultural differences. Krish gets a job at Citi Bank and gets posted at Chennai. Now, his task is to convince Ananya's parents and Ananya also has a very similar task, much later in the story. This was a good book with a bit of humour involved (although, it could be enjoyed only by the people from either of the two communities). The language was bad – frequently using terms such as “according to me”, “comprises of”, etcetera. But for that, there are hardly any negatives and I'd give this book a rating of 6/10.